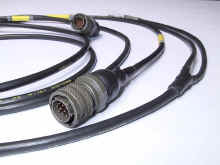 Manufacture of cables and cable harnessing using modern technology of heat shrinking tubing and memory moulded shapes. Wide range of applications from industrial products to automotive, military and aerospace industry. We are able to produce single-core, multi-core unshielded cables without branching but also multi-core shielded cable harnessing with arbitrary number of branching. Possibility to shield the whole cable harnessing. Production of samples, piece-work and also serial production. We offer you wide range of materials. You can choose types convenient for you application. Different materials versions (insulation) and cross-section available. The most used shielding is Cu 36AGW tin coated in diameters 0,8-25,4mm (nominal value), another types (Cu, Cu with silver or nickel coating, Fe, Fe with copper and tin coating, Al, bronze) available. a) General application (industry etc.) material polyolefin, shrink ratios 2:1 to 5:1, diameters 0,5-100mm after shrinking, wall thickness 0,1-5mm after shrinking, temperature of shrinking 85-135°C, working temperature range 55 to 135°C, standard colors black, another color modification or transparent, adhesive types, many modifications. b) Special application (military,aerospace) material polyolefin, elastomer, fluoroelastomer, high flexibility even after shrinking, high chemical resistance, oil resistant, shrink ratios 2:1 to 4,5:1, diameters 0,6-100mm after shrinking, wall thickness 0,1-3,5mm after shrinking, temperature of shrinking 100-175°C, working temperature range –75 to 200°C, standard colors black, another color modification or transparent, adhesive types. Bottle Shapes for connection between cables and connectors: diameters of connectors 8-75mm, outlet for cable 2-50mm, various modifications (straight,45°,90°°) and size, adhesive types, working temperature range –70 to 150°C, temperature of shrinking 130°C. 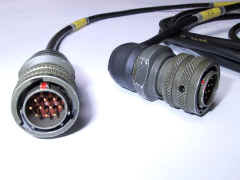 Several ways outlet Shapes: for branching cable harnessing and interconnection, input diameter 4-100mm, output diameter 2,5-50mm, outlet to 2-4 cables in flat modification or outlet to 2-6 cables in oval modification, angles 30°,45°,90°, working temperature range –75 to 150°C, temperature of shrinking 130°C, also adhesive types. All shapes produced form various kinds of materials convenient for wide range of usage. We can make a price offer and schedule of delivery for you and also advise you on choice of types.